Water contains chemical compounds that are either acidic or alkaline. Depending on the proportion of these chemicals, water may be acidic if it has a pH level below 7.0 or alkaline if the pH level is above 7.0 (neutral). The pH level of water directly affects the pH level of soil and can cause damage to plants. The most significant effect of alkaline water is plant's inability to absorb nutrients from the soil. Alkaline water is water with a pH level above 7.0. 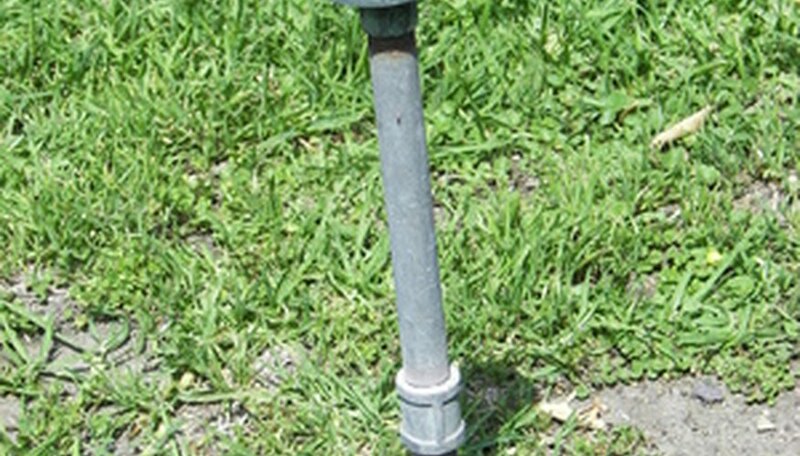 A commercial water test, in conjunction with a soil test, indicates the pH level of your water and soil, and provides recommendations for managing it. The Ohio State University Extension Service recommends that commercial growers have their water tested bi-annually and keep records of the results. Water for agricultural use comes from three sources, generally--municipal treated water, a well or a pond. Water pH levels can change over time, depending on many variables, including the season, amount of rain and climate. A high pH level in the water affects the plant's ability to obtain nutrients from the soil and can alter the pH level of the soil over time. Some plants, such as rhododendron, azaleas and blueberries, require acidic soil and won't thrive in alkaline soil. The most common sign of a high pH water level is leaf chlorosis, which is commonly seen in trees, tomatoes and some perennials. Leaf chlorosis is due to a lack of chlorophyll and occurs for many reasons, including high pH levels in the soil. The leaves turn yellow because the plant is unable to obtain needed nutrients. Iron is the nutrient most typically unavailable, although magnesium and zinc deficiencies also occur. Iron deficiencies cause young, outer leaves on trees to yellow first. Magnesium and zinc deficiencies cause older, inner leaves to yellow. High water salinity is also often associated with alkaline soils and causes salts to build up in the soil. The effects of high salinity on plants include stunted growth and wilting. Commercial growers sometimes treat alkaline water by adding acids. These acids are highly corrosive. Commercial water testers can provide information on adding acids to water, but these measures usually aren't needed by home gardeners. Instead, add iron chelate to the soil if plants show signs of chlorosis. Moistened peat moss dug into the soil increases acid and adds organic matter. Treat salinity buildup by keeping soil well drained and watering it thoroughly to leach out salts. Water softeners do not change the pH level of water. The simplest way to minimize the effects of alkaline water is to grow plants that prefer alkaline soil. Much of the western plains has alkaline soil, so consider the plants that grow natively in these regions because they are adapted to a high soil pH. Good choices include clematis, dianthus, nicotiana, iris, lantana, cotoneater, poplar and barberry.